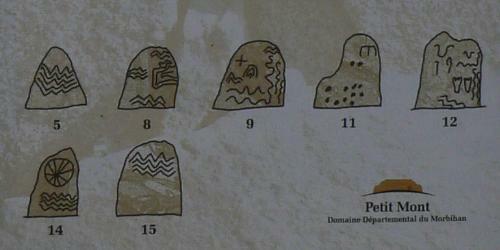 Several megalithic monuments are skilful decorated whit symbolic designs. 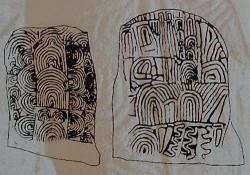 The passage tombs in Newgrange and Knowth (Irerland) and Gavrinis (Morbihan, France) give a good view on megalithic art. Less known but also very interesting are the gravures in Petit Mont (Morbihan, France). 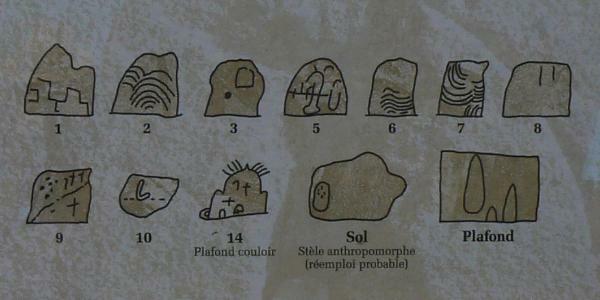 The cairn of Petit Mont (Arzon, Bretagne) houses a nice collection of megalithic symbols. Some of these symbols are also to find in other monuments. Alec Van Rompuy creates these Web Pages, all designs, maps and pictures. Except pictures marked with other author in the subscription. For questions and comments please contact the author.